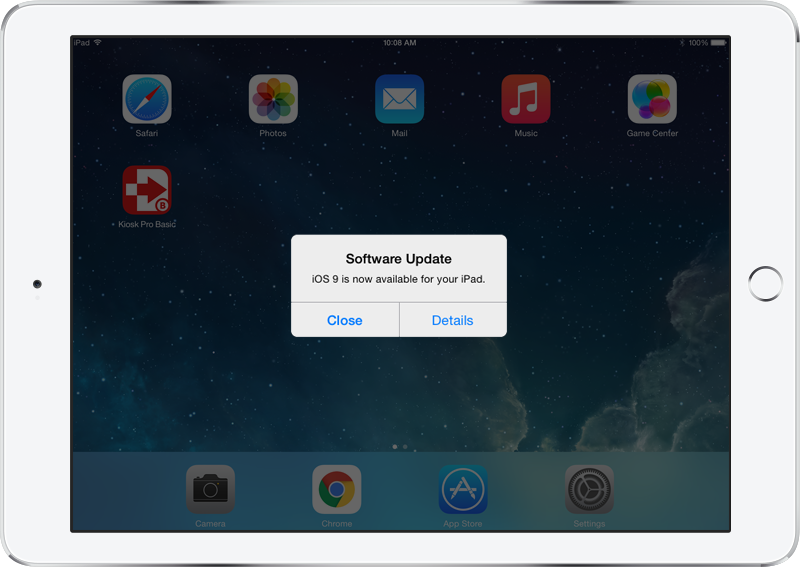 When Apple issues an update to the iOS, devices show a pop-up alert on-screen over any apps that are running asking if the user would like to update to the latest version. If the user chooses Close, it is dismissed and not shown again (until the next update). If a user chooses Details, the device redirects out of the app and directly to the main settings menu, which clearly can cause problems in a kiosk environment. As Apple prefers that users are running the latest version of iOS, they don't provide any way for apps to block this functionality directly, but you may be able to configure the iPad in such away that the pop-ups don't appear. In our testing we've found that placing the device in Guided Access mode prevents these alerts from popping up. Instructions on how to set this up can be found here. This could change in future updates, so we recommend checking your kiosks when new versions of iOS are released. We send out email alerts when this occurs, which you can sign up for here. To manually update the iOS, follow these instructions from Apple.